With over two decades of experience, we are the best sewer line repair company in San Diego. Plumbing and Drains Solutions has the experience and professionalism to take care of any plumbing issue you might have. Whether you are a homeowner, business owner or have a property management company you can count on us to handle any scope of sewer repair jobs. There are some things that even the most dedicated do-it-yourselfer should not attempt; sewer main line repair is one of them. This very large drain pipe is usually buried deep in the ground (sometimes as deep as ten feet down) and either connects your home or business’s drains to the city’s sewer lines or to your home or business’s septic tank. When this most important of pipes does clog, it causes a real mess as your raw sewage and waste water can no longer exit your home’s pipes. This can result in the interior pipes backing up and causing a large mess inside of your home or business. Be sure to give us a call if you have any questions or would like to request a free quote: (619) 345-5550. Getting your drains and sewers cleaned can often resolve many issues concerning your sewer. However, there might still be some portions of the sewer that will need to be repaired or even replaced. Below, our San Diego sewer repair technicians share some of the most common signs that the sewer is in need of a repair. If you find yourself with raw sewage backing up into you’re the yard or basement of your home or office, there is just one thing you should do, and that is dial in the number for Plumbing and Drains Solutions. Our technicians are trained and certified in main line sewer repair and can not only diagnose your problem with pinpoint precision using the very latest technologies, but they can also provide you with the information that you need in order to decide which repair option is in the best interest of your home or business (as well as within your budget). 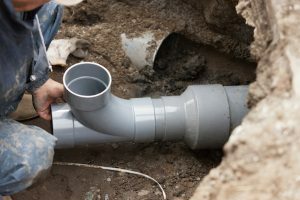 Using sewer cameras, Plumbing and Drains Solutions can find the exact point of your backup and determine if it is a simple clog, or something more serious, like a collapsed pipe. In no time at all we can have your plumbing draining quickly and clearly once again. No matter what the cause of the backup, a backed up sewer main line is not something that should be put off. By taking care of issues as soon as they are raised you can prevent serious damage before it has a chance to ruin your home. Also, the sooner you detect the problem, the less expensive your repairs are going to be. In fact, maintenance provided by Plumbing and Drains Solutions can help you to prevent embarrassing and potentially damaging main line sewer backups altogether. Drawing on the latest technological advances available in the plumbing industry, Plumbing and Drains Solutions can find and locate the source of any plumbing problem, especially with regards to your sewers. For example, we use sewer line camera inspection so that we can check the lines underground that cannot be easily detected by sight alone. If you have any questions about our services and the types of technology we use, we invite you to contact our San Diego plumbers to get the plumbing answers you need! Why Choose Plumbing and Drains Solutions? We take pride in all of the work we do because we are the best sewer line repair company in San Diego. Delivering only the highest quality of service possible. We work with professionalism and integrity, and we also draw from our years of experience in plumbing. It is important that we stay on top of all of the latest technological advancements in plumbing so that we do not get left behind. We do everything possible to make sure are a cut above the rest. Call us today for a plumbing service estimate from San Diego’s top rated plumbers. To learn more about our services, please give us a call today at (619) 345-5550!